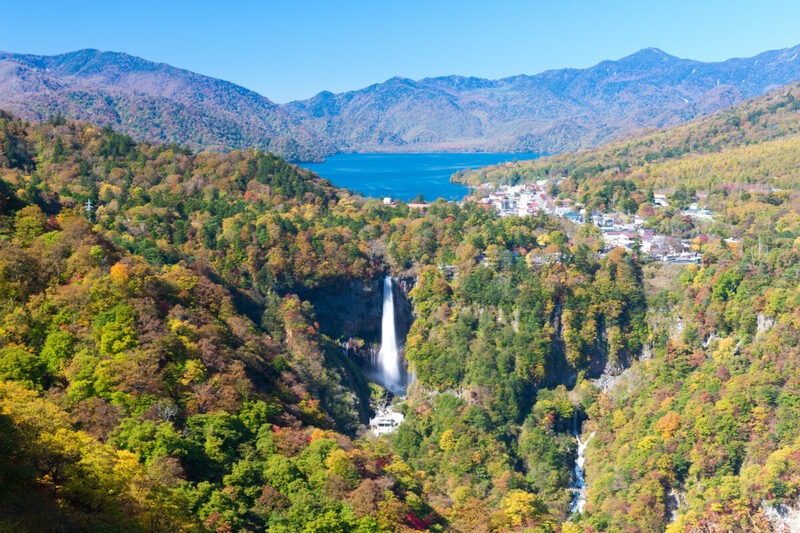 Do you like kōyō, sweet waterfalls and breathtaking landscapes? Then Nikkō is not only the perfect place but it is also not very far from Tokyo, only two hours by train. Tourists often prefer to go to Hakone. That is maybe because there are many famous onsen there, a lake with a view on Fuji-san and numerous museums… however if you love nature then Nikkō is by far a better destination. Nikkō City: the train station, many great temples and a holy bridge. This is where most visitors go and where you should go as well if you want to see Japanese culture. Chunzenji Lake: easily accessible by bus (20-30 minutes but watch out – the road is sometimes super crowded! ), it is also a very touristic area. We will go around this lake in this article. Beyond Chunzenji: a few kilometers further passed the lake, there is Yumato Onsen, Kinugawa Onsen (even better) and a beautiful swamp that we will visit in the next article. Let’s start from the top, in the heights surrounding the lake. We are here at Hangetsuyama which is actually quite a normal place. However, in autumn, it is an incredible observation point. The Ryūzu Falls are also in the heights around the lake but on the opposite side of Hangetsuyama. My previous visit being in winter, the waterfalls were really dull and sad looking but now it simply looks amazing! The name of this waterfall means Dragon’s Head but you really need a lot of imagination to see anything close to it. By going down the river, we get finally back to Chuzenji. It is the ideal place for a break even though the restaurants are a bit too expensive for what they have to offer. Let’s now visit the plumbing of the area. This is the water faucet of Nikkō: the very grand and famous Kegon Waterfall. …to land here… but without any suffering, that’s for sure.